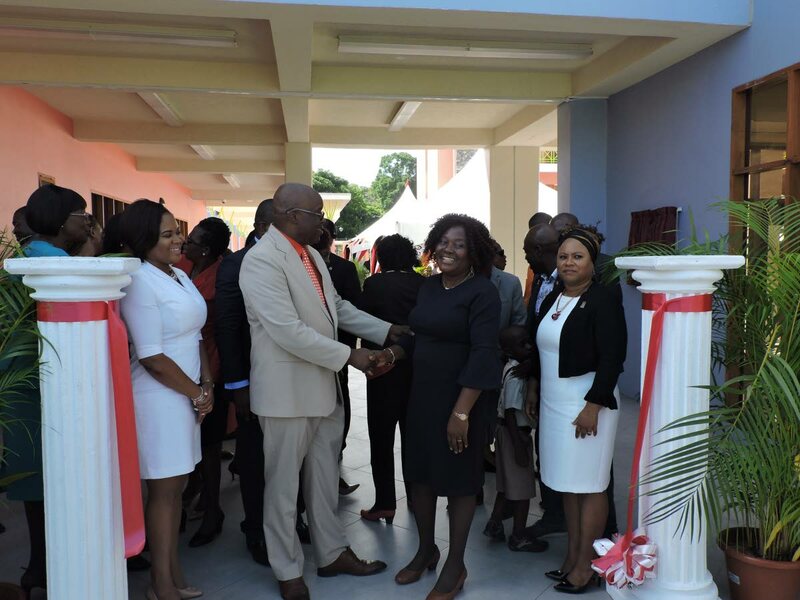 THA Chief Secretary and Secretary of Education Kelvin Charles greets acting Principal Patricia Wafe during the commissioning of the Scarborough Roman Catholic School at Smithfield Road on August 29. At left is Sports Minister and MP for Tobago West Shamfa Cudjoe, while THA’s Presiding Officer Denise Tsoiafatt Angus looks on at right. One week after meeting with officials of the Division of Education to address a matter students and teachers suffering falls from sliding tiles, President of the Scarborough RC Primary school’s Parent Teachers Association (PTA) John Chapman said on Monday that no action has been taken to fix the problem to date. Sources told Newsday Tobago that two teachers and five students have fallen after slipping on the tiles since the beginning of the school term. One teacher is said to have suffered a sprained ankle and is currently at home, while two other students received foot injuries and another student was taken the Scarborough General Hospital for medical attention after falling and hitting his head. Chapman told Newsday Tobago on Monday that at the meeting with the Division’s representative, the PTA proposed two solutions to have the problem fixed - to use an epoxy-based formula to give the tiles traction and prevent future slipping incidents or install new bar handles and raise the height of existing handles along the walkway. “They (Education Division) are yet to come up with a plan of action and a timeline as to when these adjustments will be made. I don’t want to say any more the matter as we are still in discussion with the Division to get this issue resolved,” he said. Chapman said the injured teacher was at home recovering and was doing well. He said the five students who slipped and fell were not seriously injured and were attending school. Last week Monday, the Division issued a press release stating that it was investigating reports that “a few students and one teacher have slipped and fallen on the tiles” at the school. “Additionally, upon receiving the report, the Division also promptly brought the matter to the attention of the Education Facilities Company Limited (EFCL), the Project Management Agency responsible for the construction of the Scarborough Roman Catholic School, with a view of rectifying the problems that have been identified. The EFCL has since responded with a commitment to take the necessary steps to remedy the problems in the shortest possible time,” the Division said. The release did not say what injuries, if any, the students and teacher suffered nor if they were offered any support. Efforts to reach Charles on Monday for comment were unsuccessful. On August 29, had had cut the ribbon to officially commission the school, stating then that it was OSHA compliant and easily accessible for the differently abled, was the first of its kind in TT, boasting three storeys with 27 classrooms to accommodate 750 students, a staff room, a computer room, a cafeteria, sick bay, a library, a chapel and an elevator. “This journey to relocate the school to this location was not without many challenges. Many questions arose concerning the origin of the designs, the size of structure, the rooms to be included, the outdoor spaces, the road and the projected cost. While the planning and decision making involved prolonged time, adjustments and reconsiderations, we are at last elated that the agreed structure was completed within time and budget,” he said then. Previously, on August 8, at a post Executive Council media briefing at the Administrative Complex in Calder Hall, Charles said the school was completed within the allocated time and budget. Construction, he said was supposed to have taken place within a planned time frame of 18 months with the THA expending $83 million from an original budget of $85 million. On Friday, however, Caroni East MP and a former Education Minister, Dr Tim Gopeesingh, put forward a $95 million cost for the school which is located at Smithfield Road in Scarborough. Describing the $95 million price tag as "madness," Gopeesingh raised the issue with Finance Minister Colm Imbert during consideration of expenditure for the Tobago House of Assembly (THA) at the Standing Finance Committee in Parliament on Friday. "Ninety-five million dollars for a primary school, honourable minister? When we (the previous administration) built them in Trinidad for $17 million and $15 million? To bring 650 students in a school? This is madness." In response, Imbert said the school had already been opened and the $6 million was just to deal with the final account. Gopeesingh said: "So the cost is how much minister?" Imbert replied: "I can give you details on what the $6 million will be spent on." Gopeesingh stressed that $89 million had been spent already on the school and Imbert repeated he could give details on what the $6 million in 2019 would be spent on. On the second day of the new school term, the school also suffered a bout of flooding in a classroom and along the corridor, from rainfall. Charles had said then the Division was unable to uncover the cause of the problem because no one was around when the flooding began, after heavy rainfall the previous night. He had said that heavy winds might have blown water into that side of the school. Reply to "PTA proposes fix for Scarborough RC’s slippery tiles"